To read about the Tufts Bridge Club led by President and national champion Zach Grossack, click here. The Michael Seamon Junior USBC — the contest to determine the teams that will represent the U.S. at the Junior World Team Championships in Suzhou, China next summer — is underway. Matches will be shown on BBO Vugraph starting on Thursday, Dec. 28. Under 16, who will qualify to play for the Koç University Cup – one team will be selected. For team rosters, schedule and news, view the Daily Bulletin at http://usbf.org/2017-michael-seamon-junior-usbcs/daily-bulletin. A team comprising six U.S. 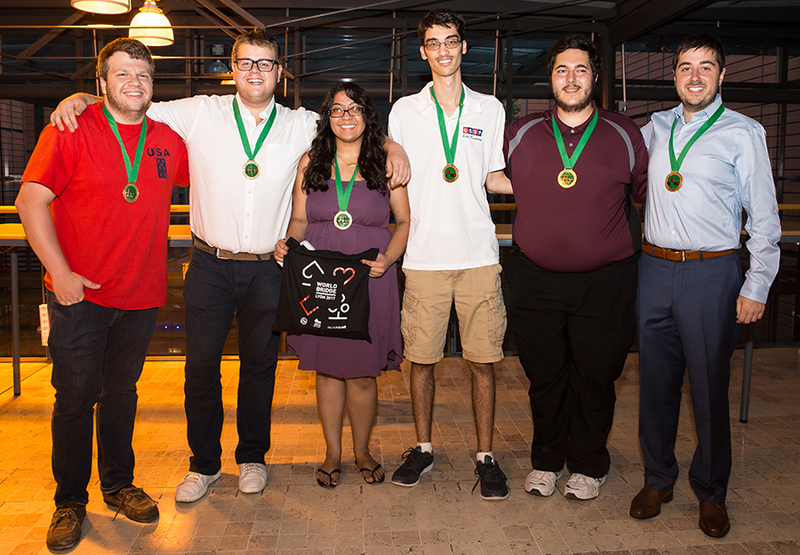 Junior players struck gold in the Funbridge World Youth Open Bridge Championships in Lyon, France. They defeated a team from Japan 164-80 to take the top spot. Kevin Rosenberg captained the winning squad, playing with Anam Tebha, Adam Grossack, Zachary Grossack, Christian Jolly and Adam Kaplan. The World Youth Open Bridge Championships are transnational events, allowing participants from any country to team up. Seventeen teams entered the Junior (under 25) division. There were also 12 under-21 teams, 15 young women’s teams and 26 kids (under 15) teams competing. CTV in Toronto has a great feature about bridge and local youth playing the game. The Annual School Bridge Tournament was held yesterday with 127 tables. Almost 500 kids participated! North’s Bridge team beat out four other high schools to win the first ever online high school Bridge tournament. North Bridge pairs captured first and second places to win the tournament, which took place on Sunday, April 2, 2017. Freshmen Amit Vallabh and Jacob Teszler won first place, while freshman Alex Ivanov and sophomore Hannah Liu tied for second. Five high schools from across the country took part in this first ever interscholastic online Bridge tournament. Along with Newton North, students from High Technology HS (NJ). The Siena School (Washington D.C), Scarsdale HS (NY), and Thomas Jefferson HS (VA) participated in the pairs tournament. But unlike other interscholastic competitions where students compete face-to-face, this one was played online. Vallabh partnered with Bridge Base, the largest online Bridge site where thousands of people, including juniors, across the world can be playing at any given time. “We’re each playing from home,” said Vallabh. A total of 20 students played in the high school tournament today. Jeff Lehman, who coaches the Newton North team and is also president of New England Youth Bridge, says Bridge is particularly suited for the high school mind. “Each Bridge hand is like a new puzzle,” he said, “it requires one pair of players to work together toward a common goal using logic and strategy.” Once they learn, Lehman added, they’re hooked for a lifetime. Yet, Bridge has had trouble gaining traction in schools. Bill Gates and Warren Buffet, both avid players, even pledged $1million in 2005 to promote Bridge in schools. “The biggest challenge has been finding other high school teams,” said Vallabh. While many youth play individually, few high schools actually field Bridge teams. Vallabh started researching schools in September last year. In the end, five high schools competed. The program has recently instituted “Monday Celebrity Guest Night”, where, on the first Monday of each month, a world-class player sits in, partners a junior and plays in a team match. In January Geoff Hampson participated and in February, Brad Moss. In future months it is expected that the juniors will be joined by Bobby Levin, Mike Passell and John Kranyak, among others. The USBF is most appreciative of the voluntary contributions these top players are making. Mary Lynch, a middle school teacher at North Star Charter School, taught the school bridge program to a class of 30 students. They ended the quarter long class with a duplicate tournament hosted by the Duluth Duplicate Bridge Club in Duluth Minnesota. Each student received an ACBL neon yellow backpack at the end of the quarter and trophies were awarded the top three pairs. To read the article from the Duluth Budgeteer, click here. Evan Berman, a senior at Cardinal Mooney Catholic High School, talks about what fuels his interest in the card game of bridge. For the full article click here. For the full article from the Washington Post, click here. For the full article from Sports Illustrated, click here. Any player under the age of 21 years will be entitled to coupons that can be used for any event. These coupons will have a value of $10 per session. Any player 19 years and under will be granted free plays for each session of regionally rated events. Players under the age of 26 years named to teams to represent Zone 2 NBOs in world competitions for NABCs occurring between the time they are named to the team and the world championship will receive free plays at NABCs when playing with members of their team or members of another team representing a Zone 2 NBO. Interesting article on BridgeWinners. Check it out here.